How business services as part of SAP Cloud Platform help you to react agile on upcoming business demands. This is where SAP Cloud Platform comes into play by offering not only the technical, but as well business capabilities, which enable you to act agile on upcoming market needs and changing demands. An excellent overview on the role of SAP Cloud Platform within the Intelligent Enterprise can be found in a recent blog from my colleague Matthias Steiner. SAP has never been known as a pure technology player. Focusing on business processes is within SAP´s DNA. Taking this mindset and approach to the cloud it is obvious that SAP Cloud Platform goes far beyond a pure PaaS. Beside the broad technical capabilities, it is natural for SAP to offers a huge set of business-oriented capabilities as well on SAP Cloud Platform, hereby providing the full benefits of an enterprise business platform towards our customers. Intelligent technologies provided to you (and the entire SAP portfolio) via SAP Cloud Platform allow you to enrich any of your processes with business ready ML, IOT, AI and predictive analytics capabilities to seamless leverage these new technologies within your hybrid system landscape. If you followed the latest talks at SAPPHIRE NOW and SAP TechEd, there is another topic within the context of business platform where SAP delivers innovations on a constant basis: business services. Let´s look and elaborate on some examples to better understand how they can help you on your digital transformation journey. Why do Business Services matter? The idea is simple, but powerful: in today´s system landscapes there are lots of capabilities used over and over again in multiples applications and business processes. Often these are realized independently, which lead to multiple ways of solving a single business need. Not the perfect way! In addition, there is market pressure to add specific functionalities, maybe due to changed compliance regulation, or new technologies, which allow you to automate some of your critical processes etc. Or what about getting a consistent view on your customer data across different existing (siloed) applications within your landscape? What if you would have access to a modularized set of content rich business capabilities, developed as cloud-native services, which can be consumed easily by you at any place within your business processes? As stated at SAP TechEd: SAP´s goal is to move further towards a multi-cloud foundation giving you the reliability, scalability and elasticity of a modern cloud architecture while providing more and more business capabilities as business services on SAP Cloud Platform. Let me outline some of the existing business services and how they provide business benefits. By the way, you can get more insights including test drives of all SAP Business Services via SAP API Business Hub (link at the end of the blog – so keep on reading 😉 ) . It can be a real challenge to stay compliant on regulatory tax requirements as there are endless country-specific scenarios. Chief financial officers are challenged to keep track with constant changes to legal taxes for the products and services they offer to their markets. Wouldn’t it be helpful to have a cloud-based service which could be easily used within a given business process to solve that issue? This is exactly the role of the respective business service (SAP Localization Hub Tax) , which determines and computes applicable country-specific indirect taxes. There is no need for you to touch your core business processes in case of changes to country specific taxes or having to take care yourself that you have all the information at hand! This business service does not only automate the determination and calculation of indirect taxes, but comes with predefined, always up-to-date tax determination and computation content for more than 120 countries. How about convenience? As your customers reach you via different channels it is essential to have a 360° view on your master data to offer a perfect customer experience. But how-to solve this within a home-grown, system landscape, where business partner data spreads across various applications. The business partner service on SAP Cloud Platform ensures that you can gain a consistent view on your business partners. It allows you to maintain or reference a central business partner including address information, relationships to other business partners and enables you to consume this data consistently within your end-to-end business processes. 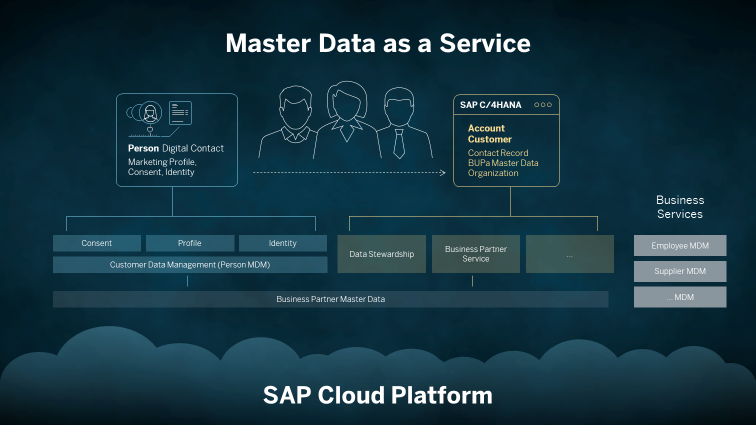 This service on business partner is the starting point and there is more to come for other master data such as product, asset, etc. 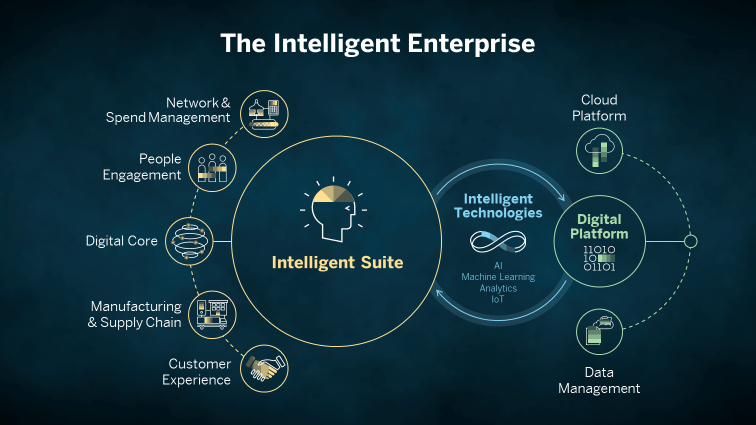 These services with a clear focus to support you getting an intelligent enterprise will enable capabilities to maintain, consume, enrich and orchestrate master data across business applications in a seamless fashion. Another good example showing the benefits of using business services is the topic of watch list screening. To ensure your compliance you need to check every new and existing customer and partner if he is on a so called denied party list, which indicates that you are not allowed to conduct business with them. Sounds easy! But you have multiple processes within your organization where business partners are being created or changed. In addition to that, these lists often change on a weekly basis. SAP´s cloud-based business service will help you to reduce your headache. Using this business service, you have one single, consistent way to check the business partner you are dealing with across all of your business processes. 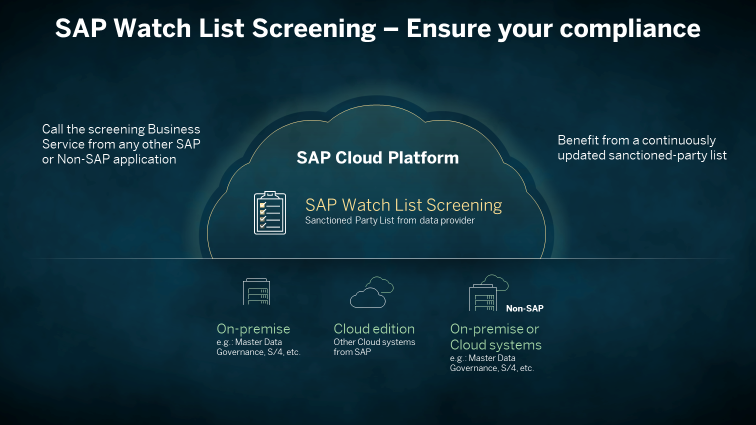 SAP Watch List Screening provides you access to the denied party list as well and this list is being updated automatically. As a result, you stay complaint and eliminate global trade violations. These were just three examples, There are many more possibilities on adding innovative business services to extend your core solution such as services to validate addresses and enrich with geocodes, to ensure you keep track with General Data Protection and Privacy Regulations (GDPR), to get up-to-date market rates, services for collaboration, to connect to blockchain networks, … and so on! Have a look into SAP API Business Hub  for further examples and all the technical details. How SAP Cloud Platform Powers the Intelligent Enterprise by Matthias Steiner.